The 2.4 GHz transverter has been completed and I used it in the vhf/uhf field day on the weekend of 15/16 November. Construction began on Sunday 9 November with the first components soldered onto the sequencer board, finishing on Friday 14th November when I finally measured the transmitter output power. The next day I was on Mt Ginini, with a 24 db gridpack dish (obtained from The RF Shop) attached to the transverter, receiving a big signal from Ted VK1BL at Mt Coree. I replied to his call and asked how he was hearing me. He replied immediately! This was my first contact on 2.4 GHz, made all the sweeter by the knowledge that the transverter was home made. Together with some other “firsts” on this field day, it made for a very good weekend. I have written up the details of the design and construction and submitted it as an article for AR magazine. The article was published in July 2009 and can be found in the AR archives here. This week’s project is to prepare for next weekend’s VHF/UHF field day. I plan to operate from a mountain southwest of Canberra, with equipment for 50, 144, 432, 1296, 2403 and 10368 MHz. The first four bands are bands I have used before but the last two are new for my station. The 2403 equipment will be a simple transverter driven by a FT290R radio on 144. The antenna for that band will be a grid type dish. 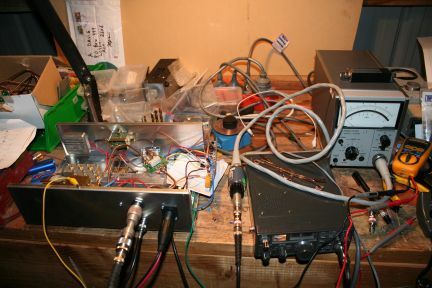 The 10368 MHz equipment has been borrowed from another local amateur. It is a transverter driven by an Icom IC202 on 144, the antenna is a dish. It all mounts on a tripod which readily allows azimuth and elevation adjustements. On all bands the main mode used will be voice, using upper sideband. For some contacts with more distant stations, morse (CW) will be used as it is much easier to hear weak morse signals than weak voices. Welcome to VK1DA’s weblog / blog. I’m Andrew Davis. VK1DA is my amateur radio callsign, which was allocated to me by the Australian Government once I satisfied the requirements for an amateur radio licence. For more details of amateur radio licencing in Australia, please see my VKFAQ website.